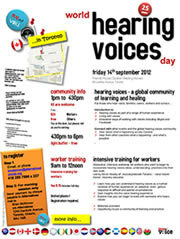 The 2012 World Hearing Voices Day marked the Hearing Voices Movement’s 25th anniversary. Its theme was to celebrate what we have achieved together and look towards our future. Celebrating the World Hearing Voices Day on Friday, 14th September 2012, PsyCope is hosting a 1 minute Silence at 12.00pm (UK Time) to celebrate the World Hearing Voices Day. Free Voices Speak Out will be hosting their World Hearing Voices Day Event Qe2 Square this Friday. The event will be running from 10.30am to 3.00pm. We will be raising money for our group so it can continue to support itself. We will be hosting a sausage sizzle and selling cold drinks, so come down and support us!!!! This is a chance to raise awareness, reduce stigma and to also celebrate 25 years of INTERVOICE , The Hearing Voices Movement and the success of our local group and its members. Exit Sozial in Linz Austria, will be organising the 7th Austria-wide meeting for people who hear voices to celebrate World Hearing Voices Day. The theme will be ‘Ways To Recovery’. On Thursday 13th there will be a public speech, an on-stage discussion and the opportunity to exchange experiences, just to warm up for the world hearing voices day. The theme will be (for both days): On Thursday everyone is welcome to join in, you don’t have to register. Entrance is free. On Friday 14th there will be a Conference from 9.30-16.00. In the morning there will be some voice-hearers telling about their way to recovery, in the afternoon there will be all kind of workshops where people can get involved with the theme of recovery. Entrance is free, but there is limited space so you must register before coming along. To celebrate the World hearing Voices Day, the team of the therapy unit Client-centred Contact Approach of the Psychiatric Centre St. Amandus at Beernem, Belgium, are organising workshops about hearing voices for staff members, nurses and paramedics involved in running of this 24-hours ward. 50 people will also be joining a workshop which includes a moment to experience voice-hearing. For those who hear voices, families, carers, workers and curious. An introduction to hearing voices as part of a range of human experience, Living with voices, Innovative ways of working with voices, including Skype and Facebook. Connect with other events in the global hearing voices community. Hear about what’s happening across Canada and hear from other countries about what’s happening and what’s possible. Voice Collective, a project supporting children and young people who hear voices, have created a true story about someone who hears voices and will be trying to get it circulated around the internet to help raise awareness. If you’d like to take part – please download a copy of this story and share it far and wide. I hear voices that other people don’t. I’m not ‘crazy’ (no-one is, that’s just a stupid label). I’m not a ‘freak’ and I don’t need anyone’s pity. I’m a strong person. I’m a survivor. I’m a musician, a sister, a friend and a geek. Best of all, I live a life that I really love. I’m lucky – not cursed. It wasn’t always like this. When I was growing up I went through some really bad stuff. No child should have to deal with that. I couldn’t talk to anyone about it, and couldn’t ask for help. Instead, I started seeing monsters. By my teens I felt lost in an alien conspiracy and, by the time I went to uni, I was overwhelmed with scary voices. I started to act weirdly and everyone thought I’d lost it. 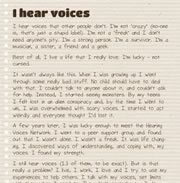 A few years later, I was lucky enough to meet the Hearing Voices Network. I went to a peer support group and found out that I wasn’t alone. I wasn’t a freak. It was life-changing. I discovered ways of understanding, and coping with, my voices. I found my strength. I still hear voices (13 of them, to be exact). But is that really a problem? I live, I work, I love and I try to use my experiences to help others. I talk with my voices, set limits with them when I need to. They don’t control me – I do. Between 3-10% of people hear voices others don’t. Voices can be helpful, frightening, inspiring, annoying or comforting. Help us celebrate World Hearing Voices Day today. Please share this story with all of your friends and help beat the stigma. The newly minted Montgomery County Hearing Voices Network would like to announce our kick-off event celebrating World Hearing Voices Day. On September 14 we invite all members of the Montgomery County community to attend a Celebration of Hearing Voices Day, 25 years of the Hearing Voices Movement. There will be storytelling, videos, information and resources, networking, volunteer opportunity exchange, and refreshments. Special attention will be given to our three Hearing Voices Groups. We invite voice hearers, supporters, allies and neighbors to join us on September 14 from 3:00 PM to 6:00 PM in the Montgomery County Human Services Building, Rooms A-B and C. 1430 DeKalb Street, Norristown, Pennsylvania 19401, USA. 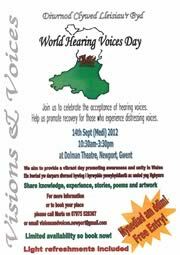 14 September (Medi) 2012, 10.30am – 3.30pm at Dolman Theatre, Newport, Gwent. Free Entry, including light refreshments. Join us to celebrate the acceptance of hearing voices. Help us promote recovery for those who experience distressing voices. We aim to provide a vibrant day promoting awareness and unity in Wales. Share knowledge, experience, stories, poems and artwork. 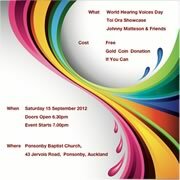 Hearing Voices Network Aotearoa NZ Auckland are having a musical World Hearing Voices Day celebration on 15 September, featuring: Toi Ora Showcase and Johnny Matterson & Friends. The event is FREE, but they welcome gold coin donations if you can. Venue: Ponsonby Baptist Church, 43 Jervois Road, Ponsonby, Auckland.